Some people say that a friend in need is a friend indeed. Yet having said that, some other people would disagree, people such as Charles Soule or Ron Garney! They'd say, sod friends! We don't need any stinking friends. We just need comic books. Plenty and plenty of comic books. Especially the following one published by Marvel in August, 2016. TO QUOTE Franz Liebkind: 'Hitler... there was a painter! He could paint an entire apartment in ONE afternoon! TWO coats!'. Part one of 'Dark Art' is basically a reclassification of Daredevils new status quo, complemented by a general plot-line setting up the initial chunk of this new story arc. At first glance this takes the form of a scene, the first scene, where we see Daredevil getting himself reacquainted with his old neighbourhood whilst taking down a group of street punks. This then switches into two other scenes, now located at the courthouse, where Matt talks to Simon about his new job and his new role as Blindspot, as well as a third scene where we see how he's been relegated to attend night court, largely due to his poor showing with the Tenfingers case (among other things). 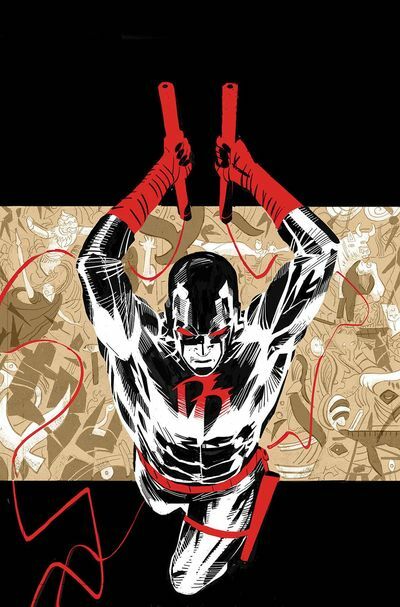 By scene four, however, the story's emphasis shifts gear from re-establishing Daredevils background to setting up the actual story-line. Turns out, Blindspot was given a note telling him to check out a location situated in Washington Heights, and then, when he gets there, he notices a dead body slumped by the side of a large mural! But of course, this impressionistic mural isn't your conventional over-sized mural! This mural is painted with blood, a lot of blood, taken from over one hundred and thirteen victims. And how does Blindspot figure this out? Simple. He doesn't, Daredevil does. Scared because he's an unregistered immigrant, Blindspot calls Daredevil up on the phone and asks him what he should do next. Obviously DD tells BS to stop talking BS and just call the local cops so they can process the crime scene accordingly. But no, he can't, he's too scared of the reprisals, despite being a costumed vigilante in a city that doesn't really go gaga over his kind, and I don't mean Lady GaGa. So to me, that's my only real gripe with this initial chapter: Blindspot's attitude. 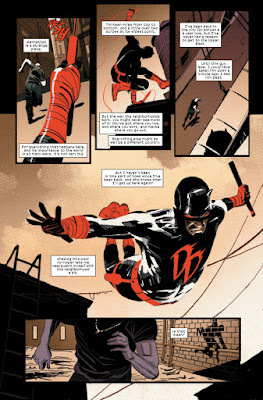 I really like Ron Garney's Frank Miller inspired black and red artwork, and I also like Charles Soule's serialized character-update as well as the situation he's placed Daredevil in. But as for Blindspot, ouch, no thank you! In my eyes he just comes across as a silly sod, not really understanding what he's doing and what he should stand for. Most heroes don't moan about their own legalities, they'd rather put other peoples legalities in front of their own. Know what I mean? Apart from that, though, on the whole this was a pretty decent issue and it's starting to tell a pretty intriguing story-line. Who is this artistic murderer and who will he kill next? 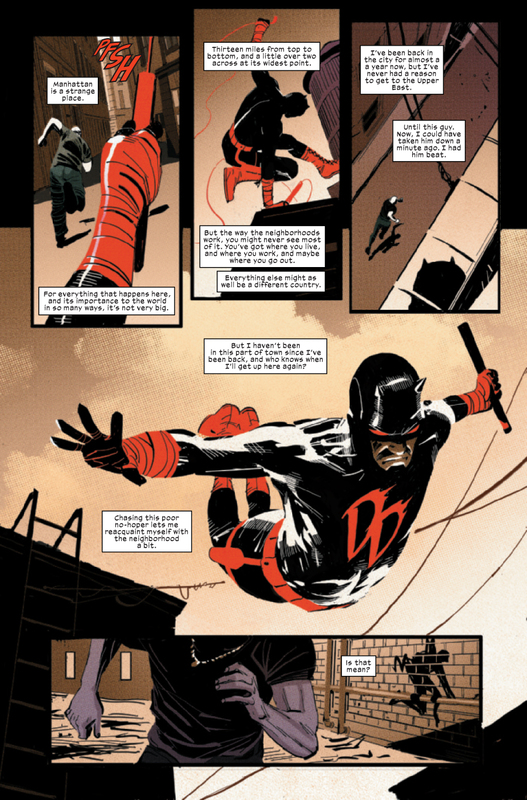 How long can Daredevil keep up with his new job, teaching, and crusading balancing act? Not long, for sure. But let's see, shall we? One of the central themes that run throughout this issue is the notion and practicality of painting a picture. 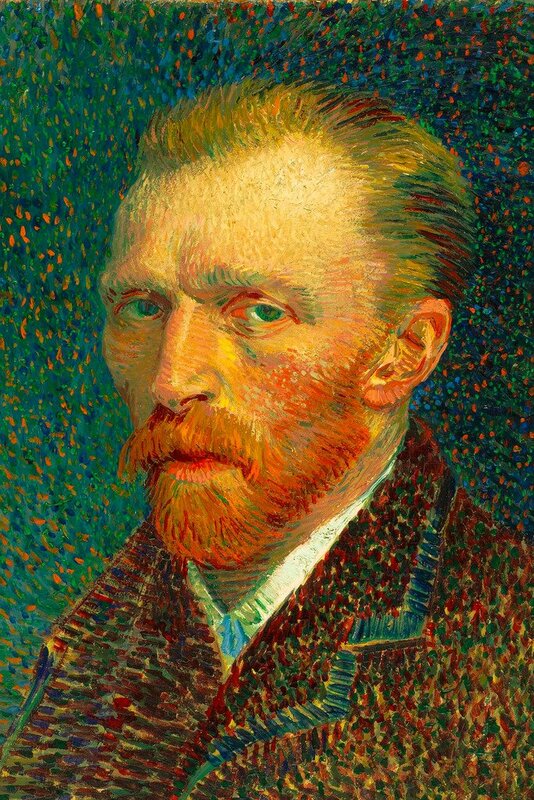 So to me, the best way to represent this in musical form is none other than in the Don Mclean ballad, 'Vincent', based on the artist Vincent Van Gogh. Exactly like my musical comparison, I'd like to now compare this comic book to, yes, you've seen the picture: Vincent Van Gogh. Like the man himself, this issue is both impressionistic with its character-work and allusive with its style. Luckily for Vin, he didn't have an annoying sidekick too. He's feeling rather randy and wants to go to the bathroom to relieve himself. Donald Trump calls him up on the phone and asks Matt for an emergency wig replacement. He can't be f*cked being a lawyer any more. Matt informs Ellen that he's a secret drag queen, and he's in dire need to go out and flaunt his stuff. A friend of his was just involved in an accident and they don't have anyone else but him to help them. Word just came in that the courthouse is under attack by a heard of gypsies. Matt tells Ellen that the makers of the new Suicide Squad movie desperately need his help in the editing room. He shoots Ellen in the face with a camera and asks to buy more film.